At the end of March, two survivors of the school shooting at Marjory Stoneman Douglas High School in 2017 and the father of a victim in the shooting at Sandy Hook Elementary in 2012 died by suicide. As the communities of Parkland and Newtown grapple with even more unimaginable loss, it is important to examine trauma and its lingering impact. Trauma is defined as a person’s exposure to a life-threatening event(s) through direct experience of the event, witnessing the event as it occurred to others, learning that such an event occurred to a loved one, or repeated exposure to the details of a traumatic event(s) (American Psychiatric Association, 2013). Events that can lead to traumatization include physical or sexual assault, motor vehicle accident, death of a loved one, natural disasters, and witnessing violence, such as in military combat and, of course, school shootings. Trauma is destabilizing and often shakes our foundations and sense of self. 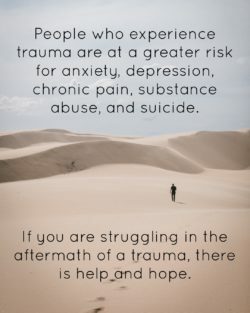 After a traumatic experience, survivors can experience a number of distressing symptoms, such as loss of a sense of safety, nightmares, flashbacks, feeling on edge, isolating or feeling detached from others, physical discomfort, avoiding reminders of the event, and feeling numb. These symptoms can cause difficulty returning to work or school and engaging in relationships with others. Survivors of trauma can develop depression, anxiety, substance abuse issues, phobias, chronic pain, and self-harming behaviors (American Psychiatric Association, 2013). Those who experience trauma are at a higher risk of suicide. When looking at trauma, it is important to note that trauma is in the response to an event, not the event itself (Levine, 1997). While trauma survivors typically experience significant distress after a traumatic event, not all develop Post-Traumatic Stress Disorder. Many survivors slowly start to feel better after a few months. However, other survivors do not, which can lead to them feeling alone and confused. Often times, trauma survivors are given messages to “move on” or “put aside their feelings,” which can feel invalidating and isolating. Just as experiencing a traumatic event is not a choice, being traumatized is not a choice. Trauma can affect any person at any age at any time. Two friends can go through the same car accident and one might be able to recover and quickly return to everyday activities where the other is not. Certain factors affect whether someone develops Post-Traumatic Stress Disorder, such as previous trauma, pre-existing mental health conditions such as anxiety or depression, amount of support from family and friends before and after the event, whether there is injury during the trauma, and the ability to protect oneself during the event such as fighting back or running away (Levine, 1997). Make sure you are safe. If the threat of harm is ongoing, take whatever steps you can to protect yourself. Seek assistance from close friends, family, or professionals if needed. Be kind to yourself. Remember that being traumatized is not a choice and does not mean you aren’t strong. Know that what you are feeling is normal for someone who has been through what you have. Even when it doesn’t feel like it, connecting with trusted individuals can have a significant positive impact. When you’re ready to talk, counseling and support groups are available and can help. Trauma therapists are trained to help survivors process their experiences and learn to cope with PTSD symptoms. Learn as much as you can about trauma and PTSD. Listen. Don’t worry about saying “the right thing.” Don’t give advice unless asked. Be present and supportive, and just listen. Remember that being traumatized was not this person’s choice. It’s okay to feel scared, frustrated, or even angry. These reactions are normal, so try not to judge yourself negatively if you feel this way. Get support for yourself. Whether through professional services such as counseling and group therapy or through connecting with others going through similar situations, have support from others can have a huge positive impact. American Psychiatric Association. (2013). Diagnostic and statistical manual of mental disorders, DSM-5 (5th ed.). Washington, DC: American Psychiatric Publishing. Levine, P. A. (1997). Waking the tiger: Healing trauma: the innate capacity to transform overwhelming experiences. Berkeley, Calif: North Atlantic Books. “Breaking the Silence” is a statewide media collaboration whose goal is to put a spotlight on the public health crisis of suicide. You can follow all of the stories in partnership @BreakSilenceOR , #BreakingTheSilenceOR , and the Breaking The Silence website. As a mental health care organization, NCC wholeheartedly supports this movement – and has been reposting some of the articles on social media platforms.